PETA may be close to settling its lawsuit involving 'Naruto' the macaque monkey and a selfie it allegedly took using photographer David Slater's camera. 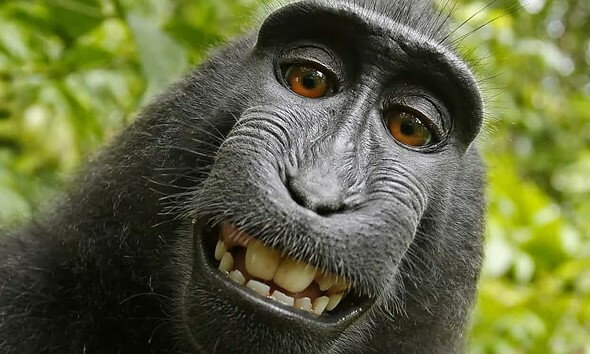 Per PETA's 2015 legal claim, Naruto (the monkey) owns the copyright to the image, not Slater, because the animal took the selfie on its own—that lawsuit, which has dragged on for the better part of two years, has left Slater broke. Slater's troubles began shortly after the photo went viral, as multiple entities refused to remove the image from their publications on claims that Slater wasn't the copyright owner. That boiled over into an official guidance issued by the U.S. Copyright Office, which stated that, under U.S. law, a copyright can only be issued on work created by a human. This effectively left the image without a copyright. Joining the bandwagon soon after that guidance was issued was PETA, with its 2015 legal claim on behalf of the monkey. PETA argues that the monkey itself owns the copyright because it took the image; all the while, Slater continued to assert his own copyright claim over the image. The matter ultimately ended up in court. Last month during oral arguments, PETA's attorney was grilled by judges on several topics, including whether the company has a suitable relationship with 'Naruto' the monkey to bring a lawsuit on its behalf, as well as whether a non-human animal has the legal standing to bring a copyright lawsuit. This itself followed a case dismissal by a federal court in California, which found that a monkey isn't legally able to hold the image's copyright under the U.S. Copyright Act. The parties have agreed on a general framework for a settlement subject to the negotiation and resolution of specific terms. The parties are optimistic that they will be able to reach an agreement that will resolve all claims in this matter. The terms of this potential settlement weren't detailed. "Peta's appeal on the "monkey's behalf" was dismissed but Mr Slater has agreed to donate 25% of any future revenue." Will Peta now be responsible for two years of legal fees? Yep, I read the story on the BBC earlier today. Good thing that the appeal judge in SF ruled in Slater's favor. what in the name of fk ? what is this sh*t ? i wonder what will happen if his camera was broken by the monkey, will peta even give a sh*t ? Does this mean we can send PETA the bill if an animal breaks our camera gear? If the macaque doesn't even know he's being represented, how can PETA's lawyers assert they are acting on his/her behalf? Sounds like yet another example of over anthropomorphizing by loonies who have nothing better to do. PETA are a bunch of nutjobs who should be sent to the Moon where they can't hurt anyone. Where is the monkey now? In captivity? No one even knows which monkey took the photo. And even if they know, they can't prove it. Send in a dental pathology expert. Perhaps he even left his DNA on the gear? Hope David's laywer goes pro-deo in this stage, as not to settle for anything but full compensation of legal cost, plus some. As usual, the only winners are the lawyers. This beautiful image would not be possible without Slater setting up his camera with the greatest care and skill. How many tries before he got to this result? To say that he does not own the copyright is plain lunacy. Common sense shows you are right but the world is going crazy. Setting up a camera, no matter how carefully, does not earn one a copyright. Some have to get over the idea that the rights to every image must be owned by someone. "One of them must have accidentally knocked the camera and set it off..."
"He must have taken hundreds of pictures by the time I got my camera back, but not very many were in focus." First you argued that Slater wouldn't be entitled to copyright if he had set up the camera carefully. Then you looked for evidence online to prove that Slater didn't set up a camera carefully, which implies that you do believe that carefully setting up a camera is instrumental in owning copyright and that Slater waived his ownership by not doing so. I'm saying that regardless of how much care Slater took in training monkeys, buying expensive gear, and setting the camera on a tripod he still doesn't get a copyright because the fact is he didn't take the picture. It is Slater who now claims to deserve a copyright based on all of his work, despite the fact that his earlier descriptions makes the photos seem a random accident, and despite the fact that the amount of time and money spent are not contributing factors towards copyright assignment. Bobthearch if a nature photographer sets up a camera to take a picture with a motion triggered remote shutter, who gets the copyright? Why is this case different to that, given that in neither cases did the photographer actually press the trigger? I don't know that it is different. I don't think anyone knows for sure (yet). Can you link to a copyright dispute court decision based on a motion sensor, or any mention of motion sensors or laser triggers within the USCO copyright guidelines? Here is some discussion with references that might be relevant. Scroll to "Pre-positioned recording devices." I don't think a photographer's copyright of images taken with motion sensor traps has ever been doubted before? Certainly there was no issue when Steve Winter won BBC Wildlife photo of the year with a snow leopard captured by a remote shutter trap, something he wouldn't have been able to do if he didn't have the copyright on the image. I think the key quote from that Wikipedia article is: "A plaintiff could argue that the placing of the video camera and possibly even its operation involved skill, judgment and labour. These are the hallmarks of the test of originality for the subsistence of copyright". Security camera footage that happens to capture some dramatic action might not meet those criteria, but a camera that has been specifically set up to take the shot in question surely does. I think you're probably right. But neither surveillance footage nor setting up a camera set up to capture a specific image are the same thing as monkeys randomly taking pictures. And you're the one that brought it up despite it being completely different. Slater claims he gave the monkeys the camera with the specific intent that they would "accidentally" take photos with it. As the shoot was specifically engineered by him, and as no monkey has come forward to dispute that version of events, it seems like his setting up of the situation is plenty enough for a strong copyright claim. > And you're the one that brought it up despite it being completely different. I already made the connection - in both cases a human wasn't involved in the actual act of taking the photograph. If a photo taken automatically by a motion trigger is copyright of the photographer who set the equipment up, then it follows that a photo triggered by an animal in any way is also copyright of the photographer who set the equipment up. Neither is the same as Steve Winter's painstaking use of motion triggers to deliberately capture a specific image. You can rightly criticise Slater for embellishing his original story, but if even security camera footage is debated to have copyright protection then anyone who sets up equipment to take a particular photo, even if the outcome is unpredictable, then they have a very strong copyright claim. "the Office will not register works produced by a machine or mere mechanical process that operates randomly or automatically without any creative input or intervention from a human author." "The U.S. Copyright Office will register an original work of authorship, provided that the work was created by a human being." Escuse me but the notion of taking a picture is a fusy one. There lot of way it can happen without pressing the shutter yourself and even if you did press the shutter, it could be unintentionnally. What can't be denied is that without Slater to setup the thing, go over the images and publising the best one, this photo wouldn't exist for us. The will of the photographer can't be denied in what he tried to achieve. He obviously was the only human in the area and he put effort into this, so for sure he can be the only copyright owner of that photo. There artist that made painting by putting paint over the tail of some animal and we call it art, not denying the intellectual property. This is no different. I hope that the funders of PETA will have a serious discussion re the continued employment of their director(s), who authorised this absurd law suit. If I was a funder of PETA (I am not and never will be), I would consider suing the director(s) concerned for wasting the fund's money in a rash and inappropriate manner. Getting lots of press for doing absurd things is pretty much what PETA does, so this lawsuit has been a massive success for them. PETA is nothing more than an anarchist group who's sole purpose is to create chaos. The fact they chose "animal rights" as their nonsensical vehicle by which too pursue their goals is incidental. In the future, should the emergence of a new space-adapted human race be confirmed, will they lose their copyright? This will be recorded in the history books as one of the reasons the West was lost. Maybe Google could hire 'Naruto' to replace James Damore as part of increasing diversity, just keep him away from a camera. I suspect history books will identify Trump and his supporters as the more likely cause of the West's decline. Trump is our last best hope on the war against western civilization. Amazing how many people miss this. yeah, the lying clinton family is better. lmao.. just search "clinton's lies".. and see for yourself..
Who said there are only two choices? If Trump is truly our "last, best hope," western civilization is clearly doomed. The guy can't accomplish anything but to blame anyone and everyone for his inability to accomplish anything of consequence. As ridiculous as this is, then it's not ridiculous to be aware that all animals that trigger selfies via trigger traps own the rights to their photos. All the monkey did was trigger the camera, the ridiculous court and PETA acting as if he knew how to really use it. There for, according to the judges any animal that triggers a camera owns the rights to the photo. I wish the court would stick to their guns and ruled as human ownership. Treating any animal on a human level in the court system is downright dangerous, opening the door for future ridiculous litigation. So now, when the monkey bites me can I personally sue him/her? "There for, according to the judges any animal that triggers a camera owns the rights to the photo." No judge has ever said that. Animals don't have property rights. It's highly doubtful that a monkey, or, for that matter, any animal other than Homo Sapiens, has any concept of what property rights are. And it goes without saying that PETA has no standing to file a lawsuit on that monkey's behalf. I hope Slater takes PETA to the cleaners over this insane misuse of our legal system. I'd like to think he'll win enough to retire to some tropical paradise. He's earned it. Tell that to cats.... Cats certainly know property rights! Cats own a lot of things, keyboards, cardboard boxes, even humans! @citizenlouie Sure, cats are the rightful rulers of the galaxy. Everyone knows that. But getting that to hold up in court is another matter. and cats ??? cats ............. dont even ask! @cosinaphile - The courts don't give a damn about what you don't give a damn about. Animal territoriality has nothing to do with property rights. a question , if you are walking across the african savahanna and a pride of lions atacks you and eats you alive ,, has a murder been committed ? I originally wrote my response to lighten things up. But I suppose it won't stop people from bickering to each other. I rather like how animals seems to have everything figured out. They only take what they need, attack only when they need foods. Next time, thank a cat when he/she/it decides to sit on your keyboard, because you might have typed some hurting words that you would later regret. Cats do help people to maintain their sanity, and their wisdom makes you think whether humanity has made a wrong turn. - The author of this post is not responsible for messy liter box accident nor damages to furniture your cat causes. You can have diverse opinions whether monkeys can hold Copyrights or whether the guy holds the Copyright to images taken by monkeys. We can discuss that till the sun goes down. But one thing I am quite certain is true is that he has only himself to blame becoming broke. How on earth could he have been better off if this picture never was taken? Lawyers don't usually work pro bono? It's hardly a matter of opinion as to whether monkeys can hold copyrights. Only human beings have property rights of any kind. The law is unequivocal on that. Opinion doesn't factor into it. PETA had no case and no standing. And whoever in that organization decided to file the lawsuit deserves to be sacked. Slater can't be blamed for defending his copyright. He may be broke at the moment, but that's about to change. PETA will end up shoveling money into his bank account over this farce of a lawsuit. "PETA will end up shoveling money into his bank account over this farce of a lawsuit." That's the thing, PETA has people donating money to raise issues of monkey copyright infringement (which by the way, did the monkey ever ask them to? Probably not because he's a damned money) whereas a single photographer likely does not have a bunch of people lined up to donate money to defend himself from ridiculous lawsuits. Sure, a lawyer might work pro bono if the payoff at the end is likely to be substantial, but lawyers aren't gamblers and lawyers get paid whether you win or lose. I'm never going to america..
we are glad to hear that. It's a dummies world: like the idea that schools use to stop you photographing concerts and sports days and outings- that we cant let you because you have not got their parents permission. Well folks, you may have kids, I may have kids, but THEY can withold consent themselves if they want to! We as parents do not either own children or the copyright to images taken of them by machines not under our direct control, and were I the judge the case would have IMMEDIATELY been thrown out of court with all costs ordered AGAINST Peta including compensating the photographer they were so cruelly trying to make a monkey out of! By the way, the monkey gave us a photograph to enjoy. In the land of monkeys they dont think in dollar! So by extension, all those people that strap a GoPro to their dog, cat, or whatever, do not own the copyright to the video; the pet does. Umm, yeah. I am a little confused here. I thought it was the photographers lawsuit agianst wikimedia that made him broke. You can hardly blame that on PETA. Does anyone know why the monkey won't be getting a Canon 6D MK II ? Waiting for the D850? Can Naruto own F Mount Lenses? Because even he wont touch that sh!t? Not enough of an upgrade. Thanks.I thought maybe it was the DR thing so if it was I guess the monkey could combine exposures with the help of a gorilla pod. He read on the forum that camera has poor IQ. I’m reminded of the time Inspector Clouseau tried to fine a man with a monkey and an organ grinder. The man argued that he wasn’t responsible because the monkey was grinding the organ all on its own. PETA clearly didn’t understand the comedy. Apparently neither did you! The man was playing the organ, people left money which the monkey collected. Clouseau told the man that it was a "commercial enterprise without a license", and the man's argument was that it was not a commercial enterprise because he was not directly asking for money. He was "a simple musician", and people gave the monkey money. What the monkey did with that money was his own choice. Totally agree with other posters here -- the image has certainly brought positive attention to animal welfare. Surprising that PETA would want to step in and financially ruin this individual over it. After all, if he wasn't there with his camera, this photo wouldn't even exist. My hunch is they had a bone to pick, and didn't want the photographer making so much as a dime off this image. Mission accomplished... at least for now. Geez. What's up is down, what's left is right. Note that the photographer had problems even before PETA stepped in. There have been articles about that also in DPReview. The photographer should claim that in fact the monkey was his paid assistant, so in that case the copyright is clearly with the contracter. Payment would be a banana or so. And the monkey actually gives a rats furry behind on behalf the whole story. Payments under a certain amount (10 Bananas or less per day) don't have to be declared or if so a receipt from the monkey with a finger- or buttprint is sufficient. As an animal rights activist and a photographer, I have no problem discerning who is in the right here (in my considered opinion of course). The photographer has brought so much more to the image than the ape simply and unknowingly pressing a button. PETA are shameless cash grabbing self publicists who are quite happy to kill thousands of animals in their 'rescue centres' across the US. They are an embarrasment to the animal rights lobby and the sort of fools that destroy the good work of many dedicated activists. PETA should lose this case, pay the photographer's fees and pay compensation for its ruinous behaviour towards him. The ape will never gain from this sorry affair. Hopefully Peta will finally slip from the animal rights radar and let rational thought prevail. Photographers can be extremely powerful advocates for wildlife conservation and bring to our attention the exquisite beauty of the world around us- surely a much greater asset to animals than the tawdry actions of PETA. "PETA are shameless cash grabbing self publicists who are quite happy to kill thousands of animals in their 'rescue centres' across the US." Taffytubby, yeah, that website is owned and run by CCF (Center for Consumer Freedom (and prior to that called the Guest Choice Network; an American non-profit entity founded by Richard Berman that lobbies on behalf of the fast food, meat, alcohol and tobacco industries). lol, everyone knows PETA euthanizes countless thousands of animals. What else are they supposed to do with them all? taffytubby, I no more believe in the veracity of the Virginia Department of Agriculture, than I do in the "Department for Environment Food & Rural Affairs" here in the UK; they are lobbyists for the meat industry. However you have cited a lot of sources there, particularly regarding Nathan Winograd. I am interested and will take the time to research the issue further. Not tonight though - even animal-lovers need to sleep. Cheers for now. It's not an issue of your belief, it's the robustness of the data. Surely if PETA are gung-ho about suing a photographer on behalf of an ape that will never benefit from their litigation then they'd be very happy to sue VADCS over misleading/erroneuos data. Just think of the cash they'd rake in. The suit was never about the photographs per se, but a test case that tried to establish precedent in law that non-human animals have the right to own property. This is consistent with the long-term aims of PETA. Suing the VADCS on the other hand would achieve nothing in terms of animal welfare, and so would have been a waste of resources in the context of their aims and goals. The issue of Nathan Winograd and the no kill policy is more complicated and emotionally difficult. In an ideal world where society is happy to use taxes to shelter homeless animals, then of course euthanasia would not be an option. It is distressing to read about the numbers of animals euthanized, and of course the ultimate goal of PETA is to sterilise as many as possible to manage the population. "PETA killed most of the animals at its Norfolk,Va shelter in 2014, according to Dept of Ag&Consumer Serv.They killed 2,454 of its 3,369 cats,dogs\other, [but has 50 mill + $] mostly “owner surrenders,” Just 23 dogs\16 cats were adopted. # animals as PETA but saved 94% & without PETA’s millions.Seagoville Animal Services in Texas took in 1/3 of the no. (~ 700 pets) but only 1/20th\ 1% of the amount of money of PETA, saving 99% of them on a paltry $29,700 budget. In fact, 100s of cities across America are saving 90% of the animals + doing so on a fraction of PETA’s wealth. VDACS publishes info of pets are taken in , for every public \private shelter, humane society,& rescue group in Va, Virginia has far lower euthanasia rates. PETA says it must euthanize animals because it’s an “open-admissions” shelter"
Thanks for the input. I accept that Peta do euthanize, and that they don’t always do that responsibly. The dilemma is whether to have a ‘no kill’ policy, and then to house only those animals which are likely to be adopted; or whether to take in every homeless animal accepting that those animals which are aren’t adopted may have to be put to sleep. What would happen to those animals if Battersea didn’t take them in? I am thinking of plastic bags in canals and tied-up blankets on motorways. Or just shovels in backyards. I hope in the agreement they compensate the photographer for a wrongful lawsuit. Seems to me that PETA needs to gain some perspective on themselves. It sounds like there may be a countersuit against PETA for punitive damages? I doubt PETA isn't "settling" for a written public apology by the photographer. They are probably settling for the punitive damages they have to pay to the photographer. The ownership of the camera is not relevant to copyright assignment. You're like the fourth or fifth person to say this or similar. Where are you guys getting this from? Other than PETA, no one has suggested giving the copyright to a monkey. no, actually the trap is the hunter. I smiled too. That's a pretty funny image, an animal caught in a trap. It was not a trap. Not even a photo trap. It was an ordinary camera on an ordinary tripod. The curious monkeys started to play with the camera and took some images of themselves. Note that the photographer claims that he have tried to take images of the monkeys for a long time, but the monkeys did no like that and avoided to be photographed. There is actually a possibility that the monkeys actually knew what they were doing. Digital cameras shows an image for some seconds after an image is taken. And som monkeys have shown to be more clever than we earlier imagined. And even if they did not know. This is not an easy case. Monkeys can. of course, not have Copyright, but some picture do not actually have a Copyright holder. One example is surveillance camera footage, that has been disputed now and then. I agree with this argument because I know someone who is a PETA member, and who used to bombard me with links (in emails) to PETA web sites for donations, support, etc., which I did for a while, until I knew better. He had expressed numerous times, unabashedly, how much he hates humans, and that a little bug is far more important to him than a human. I had severed my friendship with him several years ago. I never liked extremists or fanatics. PETA's argument in this case is most bizarre, ludicrous, arrogant, ridiculous, and stupid, to say the least. A settlement will not solve this matter. Courts need to settle it for good. Many nature photographers set traps to take pictures of animals using motion sensing, while they are far away from the camera. Hopefully, a sane judge can make the right decision, which we know what it should be. Your story about your former PETA friend is not that uncommon. My 'generalized' comment was to this point. The motives of some of the these PETA people is similar to many that take on a cause in the sense that the cause is just a vehicle to manifest some ambition, usually power. If the cause itself dissolves, they simply find another one to run with. In the article above, they champion a happy monkey but what is in it for the monkey. Nothing. Did the monkey have fun? Looks like it. Was the monkey harmed? No. So where is the need to destroy the man that put his equipment at risk and ultimately got a picture that brought a smile to many humans face? No harm done. That is, until PETA got involved. PETA: " No, your honor". Case dismissed; pay the court cost and the photographer's legal fees. * Proper channels: Monkey (signature) > Local Notary Public > Locality cert (Mayor's office?) > County's cert > State / Province cert > Ministry of Foreign Affairs cert > USA embassy in that country > US State Department. Of course the monkey can do all of the above in a heartbeat!!! Of course what you say makes sense. But Sadly, judges sometimes have their own agenda. There are too many posts here slandering PETA on the evidence of a website, and a subsequent report, produced by an organisation - the Center for Consumer Freedom (CCF) and prior to that called the Guest Choice Network; an American non-profit entity founded by Richard Berman that lobbies on behalf of the fast food, meat, alcohol and tobacco industries. Whilst many of PETA’s decisions seem questionable, including this case of copyright, we need to keep thing in perspective. The good they do in terms of animal welfare, as opposed to those organisations like CCF whose agenda is to smear animal rights groups and to fight legislation that protects both the animals, and the consumers who want to eat safely. Maybe if PETA stuck to what it was intended to do instead of "monkeying around" by delving into other areas, it's image would be improved. It is very evident that PETA lost its way some time ago and I hope people see that and voice their opinion along with not supporting them until PETA wakes up and goes back to their original intent. Organizations that work for e.g. animal rights, or other rights, always attracts some nut cases. You see that everywhere, In politics. In sport clubs. Whatever. Sometimes a nut case gets some position and can do stuff like this. That do not make the organization bad. It is how life is. They're not against PETA, they're lukewarm on animal rights. If it was an issue they felt strongly about, they'd be all for the tactics. Not that there's anything wrong with opposing animal rights or not being too enthusiastic about them. But the anti-PETA posts here have the tone, "I'm a dyed-in-the-wool SJW on animals rights issues! Really, folks! I rescued thirty-seven cats today alone, just before breakfast! But those PETA people, they just go too far!" I mean, come on. It only takes a minimum of honesty and bravery to say what you really think instead of making up a cover story that nobody believes except other people who are sticking to more or less the same cover story. I support animal rights, and think this was a dumb issue to take a stand on. Life goes on, and it's almost never black and white. If the monkey knew what selfies were, bought the equipment, learned how to use it (good luck on reading the manual and learning curve), set everything up, took the picture, then published it, I would agree, the credit should belong to him. Pressing the button is a very small part of the 'whole picture'. I think PETA got it's comeuppance. Totally irrelevant. If I buy a camera to my kid, it does not matter that she cannot read manuals. If the kid has the camera and go out and photo on her own will, the kid has the Copyright. The same if I give a camera to a friend that never have photographed before. It is very clear that no deep insights in photo making is needed for Copyrights. The tricky part may be if I give the camera to someone that is not able to understand that she takes pictures and just likes the sound the camera makes. That PITA lawsuit really is ridiculous. Fun Fact: PETA Headquarter is located in my city and also in my city is the world's largest naval base! PETA. Welcome to the modern world where the lunatic humans have the most sway. Did the monkey actually give permission for Peta to go ahead with this lunacy ?. Without the story it would have been just another monkey picture. Probably he did not think about the copyright implications when he said that. And honestly, I believe it would have not attracted any kind of attention if he had said he took the shot. The beauty of it was in the "selfie" story. How many monkey selfies are there? Only one that I know of. How many photos of monkeys have been taken by photographers? Millions. How much money and publicity would Slater have gotten by taking yet another photo of a monkey? Zilch. Because he was telling the truth. You don't have to ask why someone told the truth. That it's the truth is reason enough. There was no differing account. Don't make stuff up. "Visiting a national park in North Sulawesi, Indonesia, award-winning photographer Mr Slater left his camera unattended for a while... One of them must have accidentally knocked the camera and set it off..."
In one telling, the photos were a complete accident. In the other, he "coaxed" the monkeys into acting as his assistant. But legally it doesn't matter because neither of those scenarios result in a copyright for Slater. The first quote is from a reporter, not from the photographer. The second quote mixes a statement by the reporter with a statement by the photographer. Neither is a full telling of what happened. You can't use reporter's words to "contradict" the photographer's words. They are not the same person. Besides, the photographer spent 3 days following the macaques, so a lot could have happened over 3 days. It is unlikely that either of those brief statements captures everything he did or everything the macaques did over 3 days. It is quite possible there was both coaxing and there was a complete accident — at different times. Apart from that, this attempt to trip up the photographer using the reporter's words is all totally besides the point. The photographer created all of the conditions for the photos to happen, interacted with the macaques, brought all of the equipment, processed all of the photos. Whether luck was involved doesn't diminish his copyright. Luck is a part of photography. 'One of them must have accidentally knocked the camera and set it off because the sound caused a bit of a frenzy, said Slater, 46. 'At first there was a lot of grimacing with their teeth showing because it was probably the first time they had ever seen a reflection. 'They were quite mischievous jumping all over my equipment, and it looked like they were already posing for the camera when one hit the button. 'At first it scared the rest of them away but they soon came back - it was amazing to watch. 'He must have taken hundreds of pictures by the time I got my camera back, but not very many were in focus. He obviously hadn't worked that out yet. "Apart from that, this attempt to trip up the photographer using the reporter's words is all totally besides the point." Actually, which version of Mr Slater's story you choose to believe is beside the point, because in neither version does Mr Slater himself 'fix' the image in it's final form. "The photographer created all of the conditions for the photos to happen,"
You don't get a copyright for that. You don't get a copyright for doing that either. "brought all of the equipment,"
You certainly don't get a copyright for doing that. "processed all of the photos." As I said, it doesn't matter. He owns the photographs either way, for the reasons I mentioned. Accidents are part of photography and don't diminish one's copyright. The full story is likely a mix of intentional and accidental events. Also, he's a photographer, not a copyright lawyer. I don't expect him to describe every fact and every detail that might impact a copyright case in his initial comments to a reporter. In the end, there isn't going to be testimony from the macaque that it was intentionally making photographs as such. All of the evidence suggests it was simply reacting to shutter sounds and reflections in the lens. It's somewhat like a dash cam in a car. If I set up a dash cam in the car I'm driving, I own the copyright to the video. It doesn't matter what actually triggered the dash cam to save video or not save video. It doesn't matter which algorithm or sensor was activated. It doesn't matter whether the car is hit by a deer, a truck or by a bicycle. If video is saved in the dash cam, I own it. It's like talking to a brick wall... Photos taken by pure accident, with no creative intent, particularly photos taken by wild animals by pure accident can not be copyrighted. "If I set up a dash cam in the car I'm driving, I own the copyright to the video." Dashcam videos likely can NOT be copyrighted. They are completely automated with no creative input from a human, just like surveillance videos. Is any of this getting through to you? Are you sure you've read this, even browsed any portion of it? "Pure accident" it was not. The photographs would not exist but for considerable labor on Mr. Slater's part. The macaque did not create a finished photograph, but rather was a non-human participant in a human process. The Copyright Office decision is the law, erroneous as it is. However, based on their decision, what Mr. Slater said earlier vs. what he said later doesn't matter a bit, as long as the monkey triggered the shutter. He is consistent on that key point, so you can't hold his statements against him. As for the dash cam, there is certainly creative input from a human. I make a creative decision when I buy it and install it and activate it. I decide to create video with a dash cam as opposed to not having a dash cam, and thus not creating that video. I decide where to position it and thus which view to capture. I decide when to drive, and thus create video. It doesn't install itself in my car. So the creative input & intervention from a human is there. Sorry but buying a consumer product and installing it does not meet the qualifications for Creative Intent, Originality, or creating the final "fixed" image. Almost every camera is a consumer product. Are consumer products banned from producing copyrightable work? Does it say somewhere that photographers need to use custom made non-consumer cameras in order to produce works that can be copyrighted? I'll be pretty sad if a dash cam art project can't by copyrighted. Especially if it is clever and original. All of that creative intent down the drain. It would be strange to be able to watch dash cam video, edit it, color grade it, and present it to an audience, and yet somehow not regard it as a final "fixed" image just because a dash cam was used. I've seen some time-lapse videos that are amazing and beautiful, exquisitely composed, timed and edited, and yet the shutter clicks were automated and the actual content was "accidental" — whatever nature presented. No creative intent if the photographer doesn't manually perform every shutter click? PETA are just another bunch of greedy hypocritical manipulators over naïve narrow-minded simpletons, as are Greenpeace, lab rats “liberators”, anti-nuclear-power activists, some feminists, leftists and whistleblowers. That's an opinion, not a statement (for the occasion if some of them decide to sue me or DPreview for these words). Also consider the chance that Naruto already is eaten by some tiger. Is Naruto still around? Will the copyright go to the children of Naruto. Can this be proved (DNA)? Oh yes, Naruto joined Magnum and is now on assignment in the US. Apparently he gets incredible access to the Whitehouse because he look like all the other members of the cabinet. Seems simple for me. The photographer supplied all materials and his actions made it possible for the monkey to make the selfie. Without the actions from the photographer there was no monkey selfie. The Monkey is a wild animal and therefore cannot claim legal rights. Peta wan't to do this for the animal, but Peta has no relation with the monkey and does it only for it's own advantage. The monkey never made a selfie, he just pressed a button, accidently or not. To me a selfie is posing in front of a lens with the intension of taking a picture of yourself (or whoever). @sknippen. I agree, it is a simple case. The photographer owns the copyright. You actually have no idea what you are talking about. That was a legitimate process. Google it for christ sake. "Legitimate process" right, you put a cup of near boiling liquid between your legs and unfortunately spill it. Both tea and coffee are made by extracting at temperatures in the range of 90-100 degrees C (96-98 for Coffee). The actual injury does not make poor judgement and an unfortunate spill a legitimate process, it makes it a very very very unfortunate accident with horrific results. Its like falling down stairs, if you break your neck it does not become a legitimate process, if you are pushed, or the coffee is pored into your lap (say when handing over the coffee at the drive thru, or the cups cannot be opened without spilling), that would make it a legitimate process. That process was more about gold digging lawyers. I can only hope we manage to get common sense into law globally. Really?! Delivering scalding hot beverage to people is not a safety issue? Did you even read the trial reports? Since then, all restaurants have lowered the beverage temperatures. What in the world do you talk about? Are you drinking 100C beverages? You find it acceptable for children in a restaurant to be scalded with 100C beverages?! The hot coffee case has absolutely nothing to do with the article above. Why the heck bring it up? @dcolak, yes I read the trial report. Just to alert, outside the US your tea and coffee are still served at regular 'normal' temperatures that can burn you. And no, I do not drink my tea at 100C, or my coffee at 96C, I let it cool down to drinkable levels. Also before giving it to children I let it cool to safe levels. @Yake, I responded as dcolak found it suitable to give links to severe injuries, additionally outside of the US this is another case that is frowned upon for the legal system having gone mental. PETA has something to do with gourmet: People Eating Tasty Animals. BTW: Not a new idea, seen it here before. People Eating Tasty Animals - I like that one, made me have a good laugh. Thank you. It's own reality TV show. A term as the US President. @Joseph K Boston, There is already a dumb animal in that role. Has a warning of graphic content, and for a reason. A single report on a single government website; against the global body of evidence showing that Peta, despite it's well-publicised mistakes, has worked to improve the welfare of animals. Correction. The website you link to: "PETA Kills Animals is a project of the Center for Consumer Freedom"
The Centre for consumer freedom is, according to Wikipedia, "Center for Consumer Freedom (CCF) and prior to that the Guest Choice Network, is an American non-profit entity founded by Richard Berman that lobbies on behalf of the fast food, meat, alcohol and tobacco industries"
The report quoted on that fake-news website is as I stated in my first reply. Please stop spreading fake news. The "Virginia Department of Agriculture and Consumer Services" (VDACS) is the government agency responsible for overseeing shelters and animal welfare matters in the state. There's no more reports about inspections from other institutions because as you probably agree with me, there's no need for a multitude of government agencies to do the task (PETA is based in Norfolk, Virginia). And oh, the CCF are so bad guys... well, those despicable people seems the only ones to have the balls to expose the facts that PETA don't want people to know. Does this mean Naruto will be sued by PETA for damages for the lost monies they are go to incure? My dog, Ralph owns all his pics and he has agent. That agent wouldn't be you by any chance? That wouldn't be terribly British (as he lives in the same town as I). It would be "Thanks for the settlement money old chum, now F* OFF! ".